A rare survival from two English parish churches dating before the Reformation, this service book comes from Ravensworth and Brompton on Swale in Yorkshire. 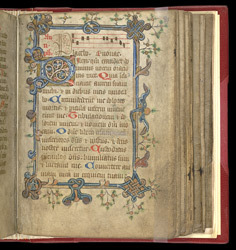 This page presents the prayers that were said by monks and provides musical notation for a hymn. It is from a book which has prayers usually appear in a type of service book called a 'breviary' which was used in monasteries and did not usually include musical notation, as well as prayers for the mass. Because it has this unusual combination, it is believed that this book provided the prayers for a monk or clergyman outside a monastery. The musical notation is further indication that it was a compact version of the several books (bibles, hymnals, breviaries) used in monasteries for their daily prayer services.